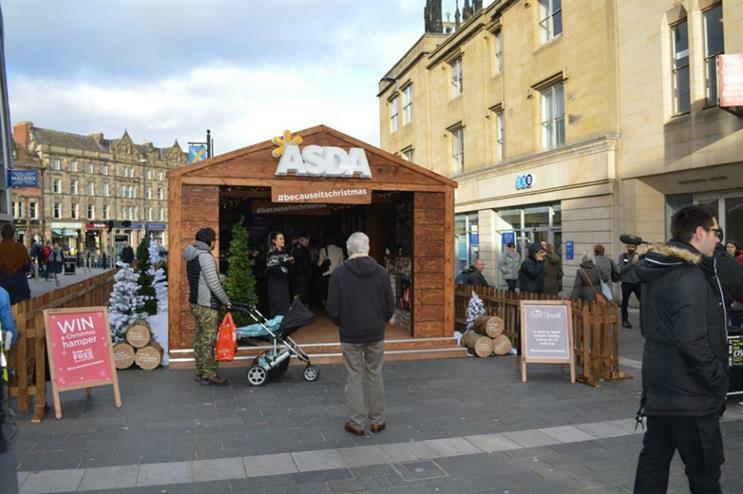 Supermarket brand Asda has devised a winter lodge roadshow to showcase its key Christmas lines. Customers are being invited to step inside The Lodge, where they will be transported to a cabin in the snowy mountains. The installation, which was produced by Momentum Worldwide, features vintage skis, sledges, Christmas trees and twinkling lights. Brand ambassadors dressed in fairisle jumpers from Asda’s retail line, George, are offering tastings of the supermarket's hero lines and key products, which have been cooked up by on-site chefs. Recipe ideas on offer include maple smoked salmon with beetroot and radish bites, and red velvet yule log - both of which are from Asda’s Extra Special range. The roadshow forms part of the grocer’s #becauseitschristmas campaign. Customers are also being encouraged to dress up in winter props and upload their photo to social media, in order to receive a free print when using the aforementioned hashtag. The Lodge embarked on its travels at Newcastle’s Northumberland Street and is also visiting Leeds, Sheffield and Bristol. The tour will come to an end on Glasgow’s Argyle Street from 10-13 December. Wi-fi technology is being used to monitor footfall and dwell time at each location. The brand will then track EPOS sales of all key lines at the relevant Asda stores to uncover the ROI of the tour. Activation and sales agency CPM devised the overall creative of The Lodge. It aims to reinforce loyalty of Asda’s primary customers and increase conversion rates of secondaries. Helen Carling, senior manager, in-store activation at Asda, said: "We are really excited to take our product out to customers to showcase Asda quality through Extra Special. We are confident that the sampling engagements and opportunities to see will showcase our great range this Christmas. "All of the chosen destination are major city centre locations that have a large Asda store presence, so customers can easily go and explore more."